No piece of home furniture is as important as a coffee table! It just bring the maturity and presence to every of you indoor and outdoor sitting plans and really make the look completed and fully functional! One can say that the addition of a coffee table to every sitting plan is must and it really doubles up your sitting fun! 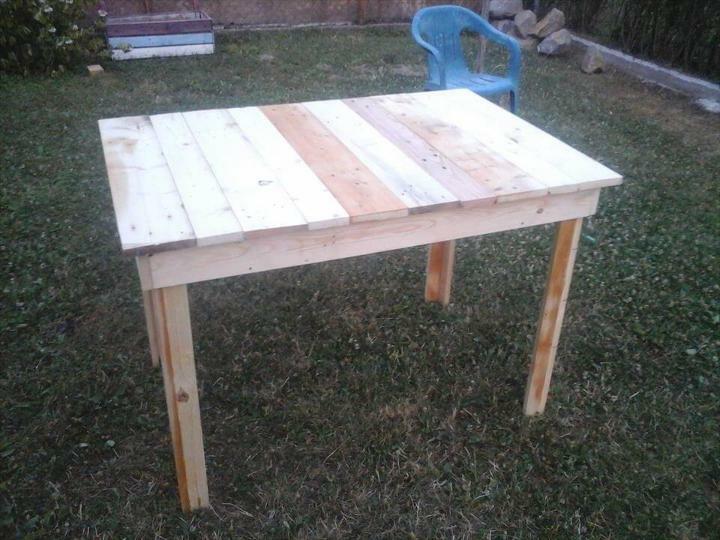 Pallet wood has really made it easier to achieve a coffee table on a friendly cost price! Take example of this DIY reclaimed pallet coffee table, a standard table size built at no-cost and is really heavy duty to live longer with you! By rebuilding, restyling and refinishing some rustic pallets this beautiful table design has been achieved that looks pretty cool due to different wood tones! Here is how one can accommodate all of his furniture needs using pallets and without spending even a bit of his hardly earned money! Just get inspired and start to think creative then get busy to improve your home extra brilliantly with pallets! Build outstanding wooden tables with pallets like coffee tables, dining tables and also those of accent tables that are use to accentuate your entryway, foyer and hallway! Also build console tables, media stands and entertainment centers with pallets without spending a bit of your money! Ideas are here to make you inspired! 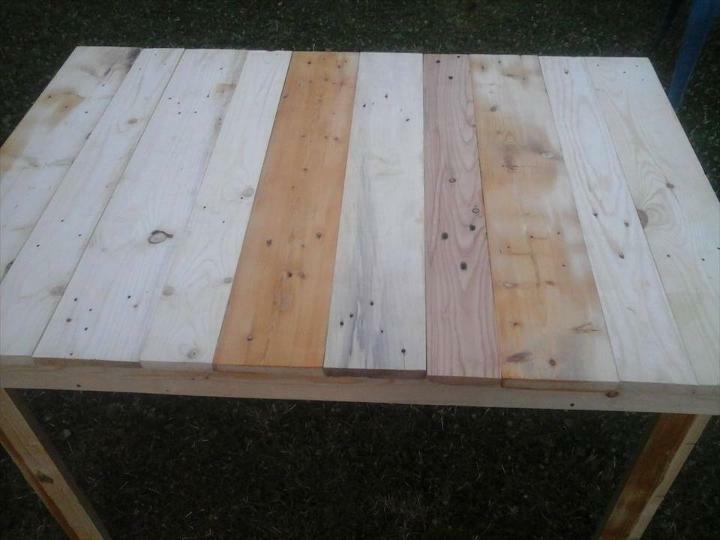 Deconstruct a pellet board and plan a tabletop using the separated pallet planks! For this purpose, you can select the planks having equal thickness and length as shown in the picture! 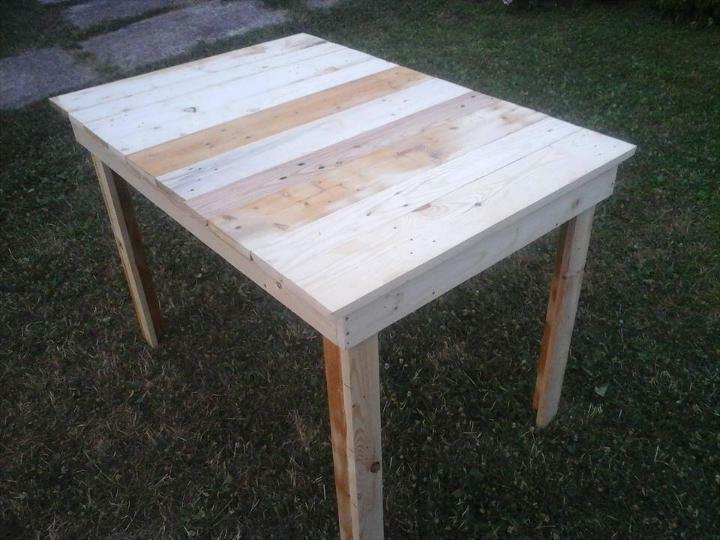 Just add nails to hold each piece in place and then finish the table with sturdy wooden legs! One can also select the metal legs and other reclaimed legs from a collapsed home furniture piece! Table has given a distressed look and has been sanded smooth and painted a little bit using white paint or white wash brush strokes! Wood medium is still visible and really give a dominant look! Legs have also been made of those removed pallet slats and are capable to handle a lot of weight! Also use stain if you want a precious and shining wood tone along with weather and water protection to wood grains! You can also design your outdoor patio or living room furniture in a very inexpensive and beautifully way.